Bring beauty to your space with these attractive newly crafted planters with a vintage-style hobnail texture. These classic white, designer inspired planters will complement just about any decor. You can add some of your favorite small plants to brighten up even the smallest of spaces. A hole on the bottom of each flower pot allows water to drain through the soil so your plant stays healthy. Simply set these beautiful planters together to create a smalll garden oasis or separate them to bring sweet style to any space. The gorgeous design and two sizes gives these jars versatility. You can use these jars as candleholders or as canisters to hold keys and other loose trinkets. **Official MyGift® product includes multipurpose cleaning towel. ** Plants shown not included. 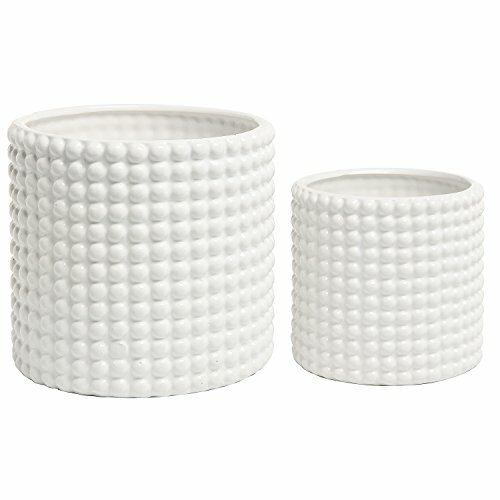 Approximate Dimensions: Large - 5.9" H x 5.5" L x 5.5" W. Small - 4.7" H x 4.3" L x 4.3" W.
Combine modern and vintage style with this matching pair of newly crafted planters with unique hobnail texture. The classic white, designer inspired planters will complement just about any decor and help brighten up your space. Create a lovely garden oasis by simply setting the pair together filled with your favorite flowers or plants. Each planter has hole on the bottom to allow water to drain through the soil so your plant stays healthy. Approximate Dimensions (in inches): Large - 5.5 H × 5.9 Diameter; Small - 4.3 H × 4.7 Diameter.